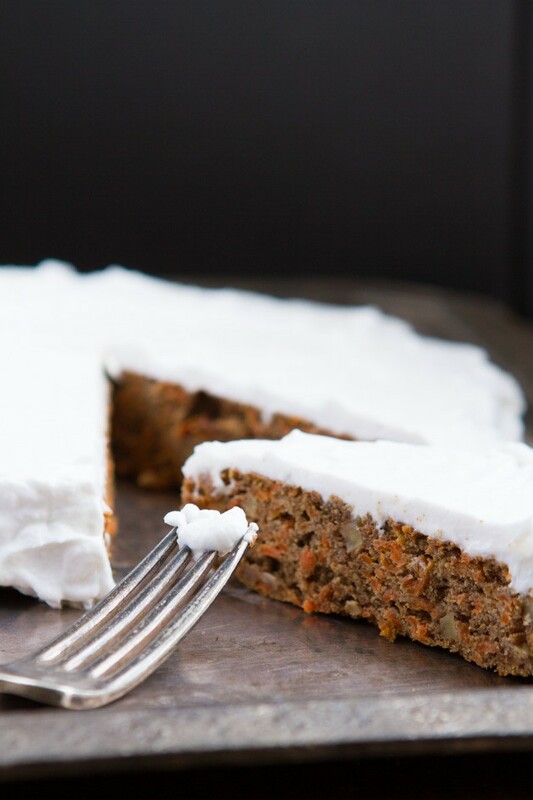 A nutrient-dense paleo carrot cake recipe that’s rich in protein. Grain-free and dairy-free… made with cricket flour! Preheat oven to 325F and line a 9-inch cake pan with parchment at the bottom. Oil the sides with tallow and set aside. Add dry ingredients to a large bowl. Combine. Meanwhile, add wet ingredients to a large bowl and whisk to combine. The oils you’ll be using are highly saturated, so they will harden with the eggs if the eggs were cold. No worries, just whisk and all is good. Transfer wet ingredient to dry and stir until combined. Mixture will be quite heavy, a bit thicker than muffin batter. Stir in shredded carrots and chopped walnuts. Transfer cake batter to prepared cake pan. Transfer to preheated oven and bake for 33-35 minutes, or until toothpick inserted comes out clean. Remove cake from oven, slide knife around the sides of the pan to loosen the edges. Allow to cool in the cake pan for 30 minutes before carefully turning over onto a cooling rack. Allow to cool for 1 hour, at least! Meanwhile, prepare the frosting. Add all ingredients to your high-powered blender or stand mixer. Blend/mix on high until combined. Transfer to the fridge until ready to use. 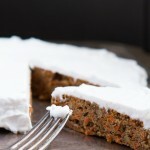 Add frosting to cake, using a spatula to distribute. Serve, transfer to a sealed cake container and place in the fridge for up to 1 day. Or cut in wedges and freeze for weekend snacks! To make double layered cake, double the Dry Ingredients and Wet Ingredients. Frosting will spread over a double layered cake, no problem. Cricket Flour: I don’t know how to make this recipe without cricket flour. Perhaps if you don’t want to try crickets you could keep this one in the back of your mind for one day that you do, or share it with a friend you want to surprise… this flour is supposed to be stored in the freezer and it likes to clump up. Use a potato masher to break up the clumps if needed.